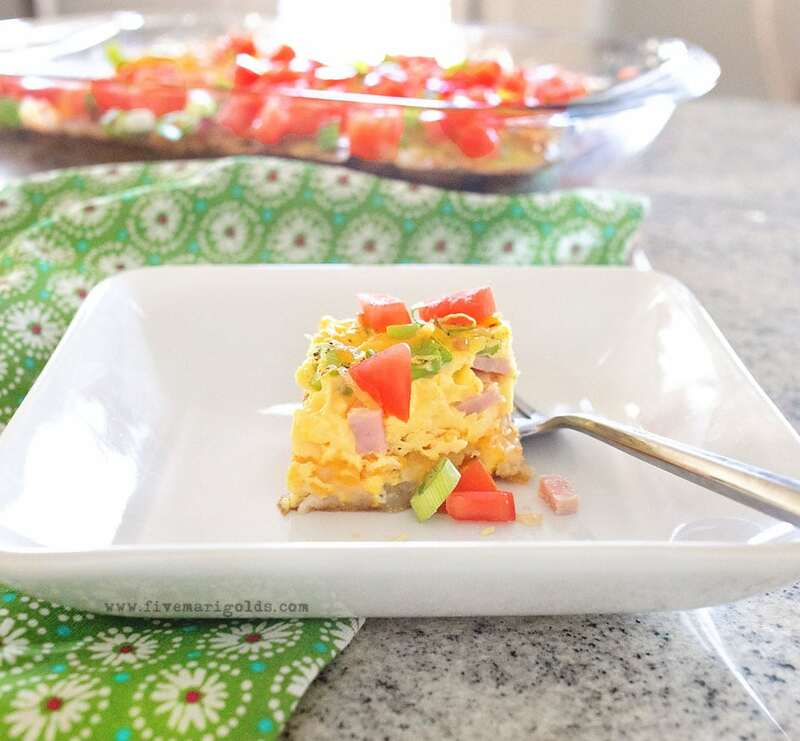 light and fluffy egg bake with crunchy hash browns, Melted cheese and fresh tomatoes. 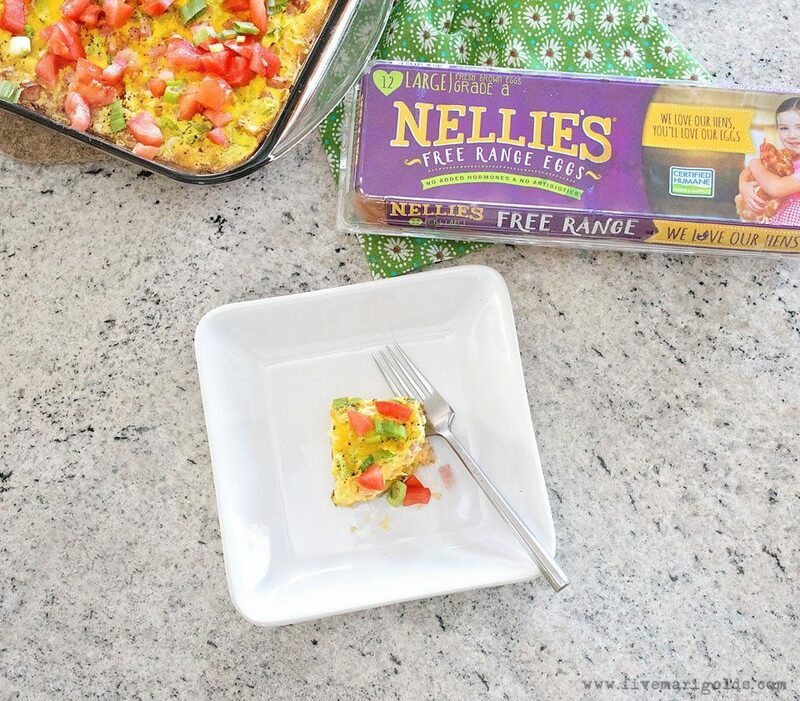 A big thank you to Nellie’s Free Range Eggs for sponsoring this recipe, Ham and Cheese Brunch Bake. All opinions are mine alone. Do you ever mysteriously forget about a recipe that you totally love? Only to rediscover it and over-celebrate its return to your life by having it weekly? Well, that’s what happened to me with the recipe I’m sharing today. 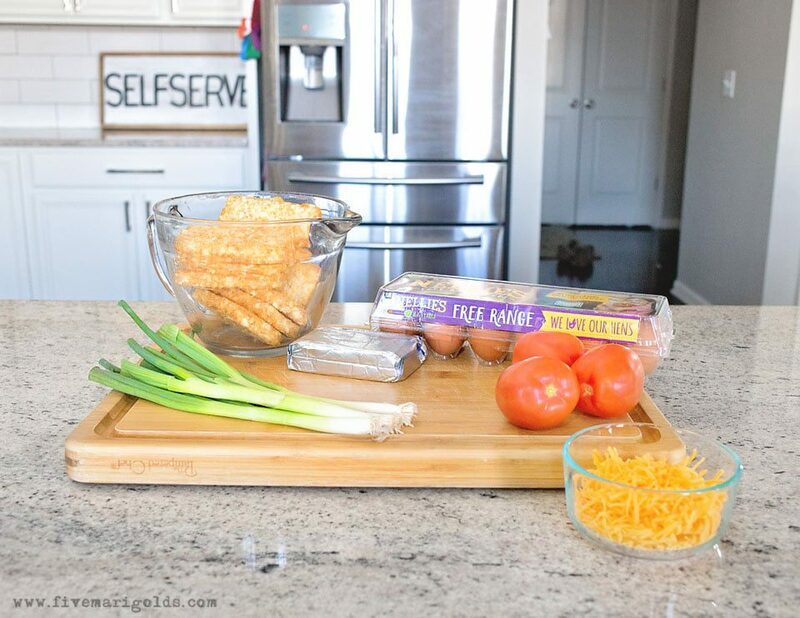 This dish has it all: fluffy eggs, crunchy hash browns, melted cheese, crunchy green onions and fresh tomatoes. It’s an amazing explosion of flavor. Years ago I began preparing this recipe when we had overnight guests, which was quite a lot. So, I graduated the dish to bring to showers and gatherings. I alllways got asked for the recipe. But, back then, there wasn’t a whole lot of brunch happening when it was just me and my husband, and I hadn’t yet discovered the awesomeness that is breakfast-for-dinner. Somehow, over time, the recipe made its way to the back of my cookbook. Which brings us to now. A few weeks ago, I had a sudden craving for this dish and I REMEMBERED. First things first: one of my favorite things to do for this recipe is to prep all of my ingredients the night before. 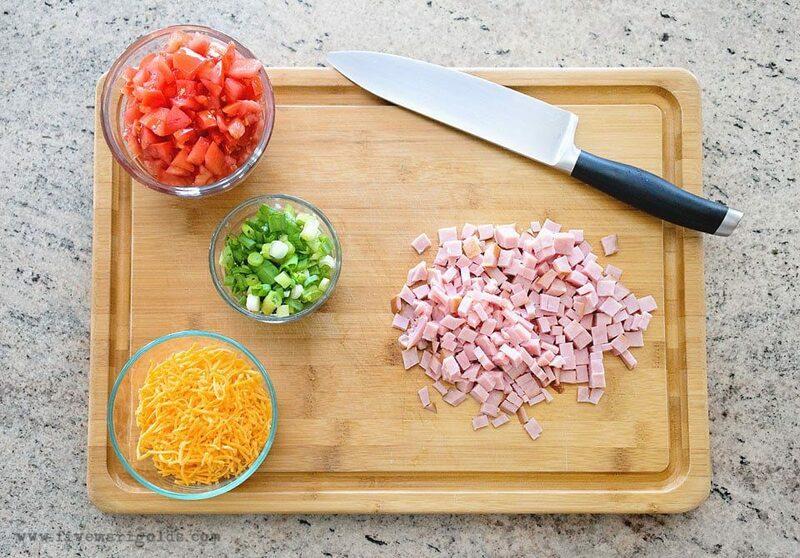 It makes for super quick work if you’re prepping this for breakfast. 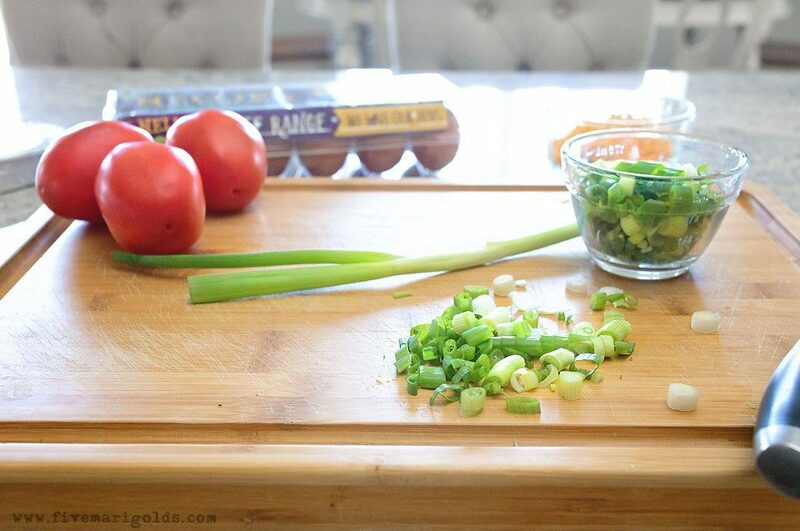 This recipe calls for 2-3 large sliced green onions and 2-3 chopped and seeded Roma tomatoes. When you wake up to prepare your Brunch Bake, you’re going to let your hash brown patties defrost about halfway, and then break them up into the bottom of a 9″x13″ baking pan. Technically, you don’t even have to break them up, but I find that this step not only makes it easier to serve, but it allows you to shove more hash browns into the recipe, which I think we all can agree is important here. 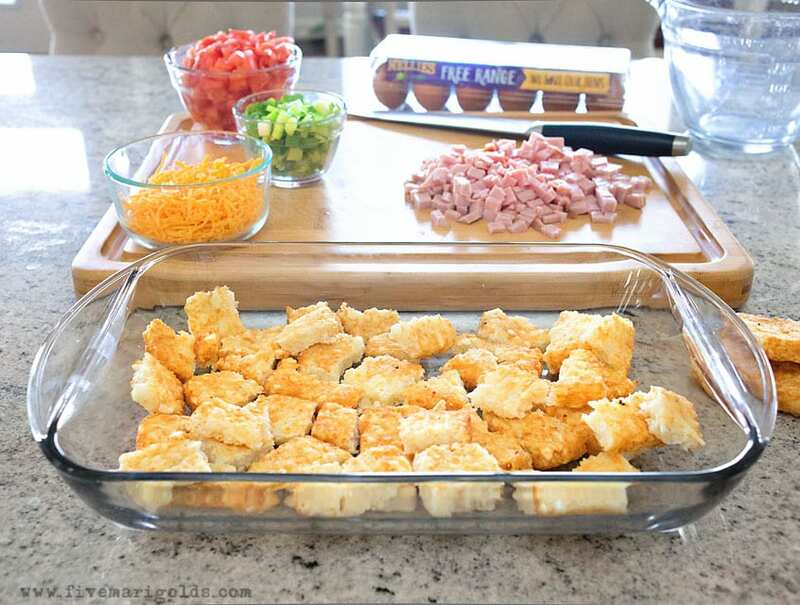 Cover the hash browns with shredded cheese and bake at 450° for about 13-15 minutes. Next, soften a brick of cream cheese until it whisks nice and smooth. Things are about to start getting really good. 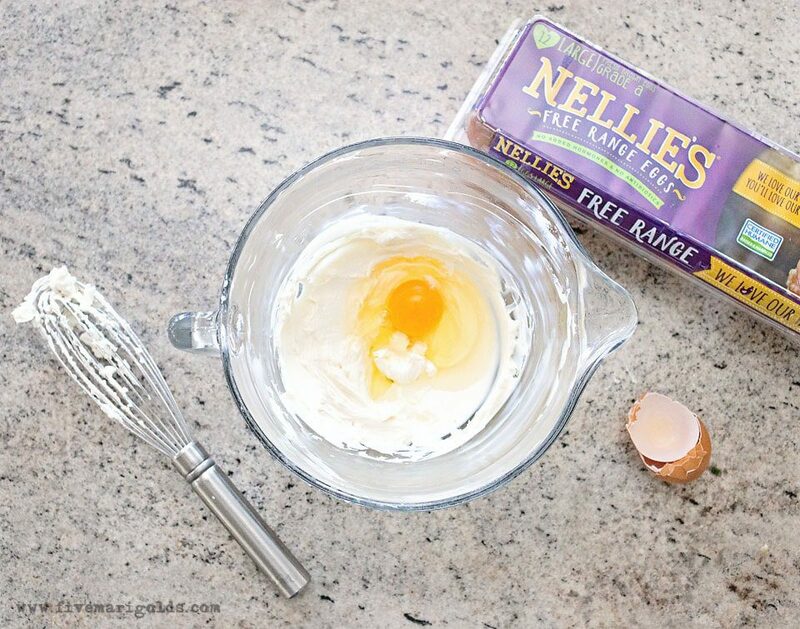 Add a dozen eggs to this mixture , whisking until blended thoroughly. 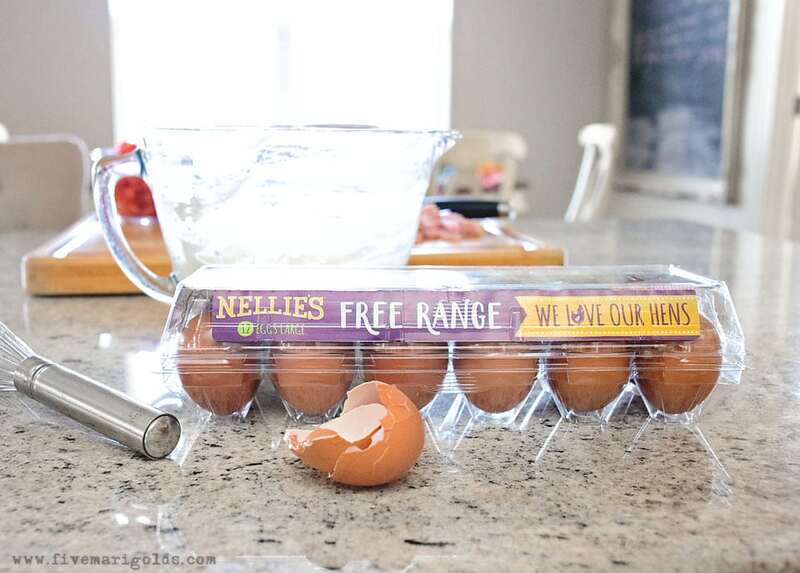 Our family recently started using Nellie’s Free Range Eggs because they have no added hormones and no antibiotics. My parents and grandparents all grew up on farms and raised their own chickens. I figure buying these eggs is the next to the best thing. The yolks are always golden and bright, because the hens are free range and spend their time outdoors eating insects. 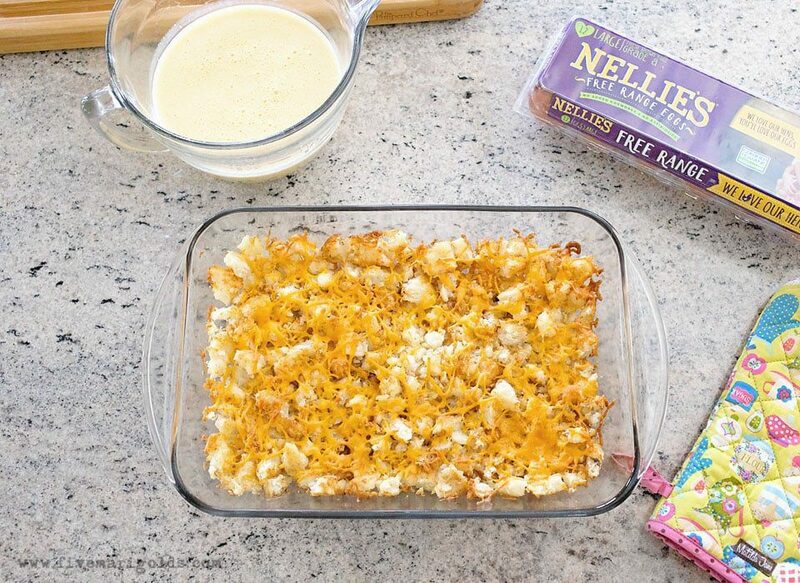 Pour the egg mixture evenly over the hash brown crust, then add the meat and about half of your sliced onions. Add a little fresh pepper on top for good measure. Bake for 20-25 minutes, or until the egg mixture is cooked thoroughly. Right out of the oven, add the remaining cheese, onions and tomatoes, and serve. You might as well slice it into generous servings, because there’s no way you can eat just one piece. In the off-chance that you have leftovers (you won’t), it does reheat well. Fair warning: if you serve this to guests, you WILL get asked for the recipe. Do yourself a favor and keep this post handy so you can share the love. Then, find more of my favorite recipes, here. As I mentioned earlier, I’ve had this recipe on repeat since I rediscovered it a few weeks ago – each time I’ve served it for supper. What are your thoughts on breakfast for dinner: yay or nay? 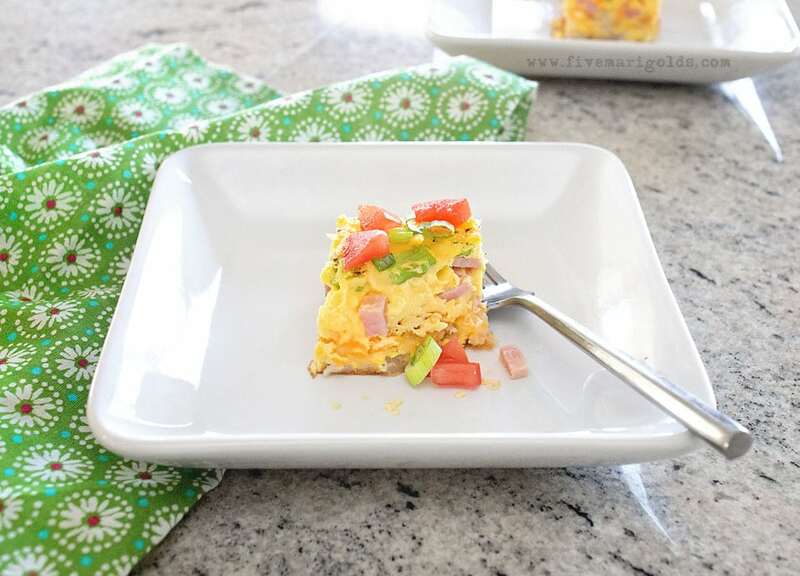 I’d love your thoughts on that, as well as this Ham and Cheese Brunch Bake recipe, in the comments below! This looks delicious and filling. Love your pictures. Aaaand now I know what I want for breakfast!! Hahahahaha! Looks delicious! This looks relish! I’m a big fan of egg bakes, they are just so EASY! Thanks for this post! 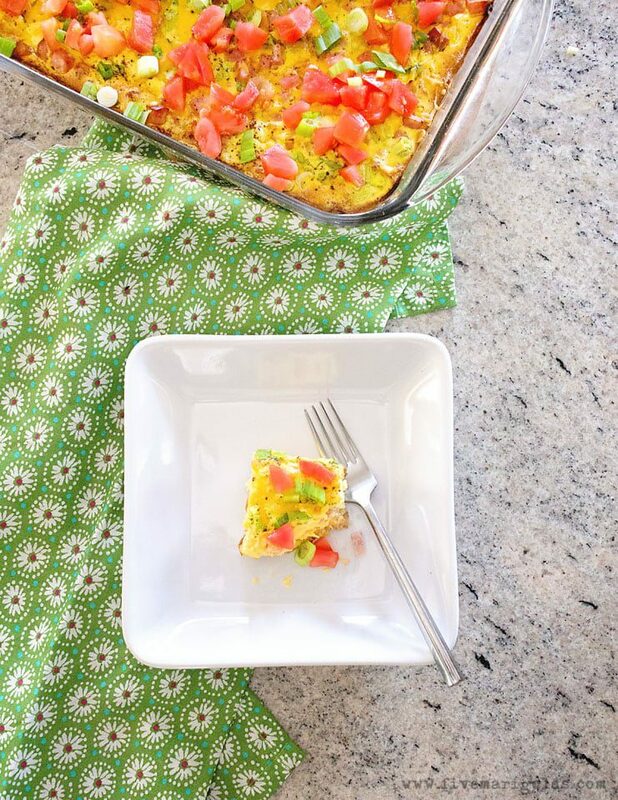 This looks delicious and exactly what I would want in a breakfast casserole. This sounds good! I’d have to leave the ham off my portion, but the rest of my family likes ham. Such a pretty and attractive dish too! Very appetizing!